OK, that’s it: I’m going to Rizzo’s for a French Dip. 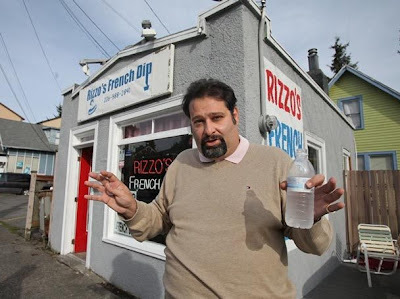 Ever since Kenny Johnson opened his sandwich joint, Rizzo’s French Dip in Ballard, I’ve been promising myself I’m going to stop in. But when I’m in the neighborhood and in the mood for beef, you can usually find me down the street at the competition. Now, after reading about Kenny’s heroics today in my morning paper, I’m here to agree with the folks who say the man who endangered his own life to save a child’s deserves our admiration — and our business. My heart goes out to the girl he saved, and to her family for their tragic loss.